Odi et Amo: Cutest. Gliders. Ever. Until very recently (like maybe yesterday) I really hadn't given much thought as to how I'll decorate the nursery. Chalk it up to exhaustion, preoccupation with work or perhaps just procrastination, but the likely truth is that I really couldn't bear the idea of launching into yet another home improvement project right now. But fortunately that's all changed thanks to that second trimester high that I'd been promised for weeks but only just now seem to be hitting. And now I can't stop scouring the web for resources and inspiration. My intentions are to stay on a pretty tight budget for this nursery because (a) the kid will outgrow it rather quickly and (b) the kid will inevitably make a mess of it. But there are a few areas I'm willing to splurge a bit on and one of those is a great glider. Not only will I appreciate a comfortable place to spend the next few months of my life, but it'll prove useful around the house long after I quit nursing. And tonight I (very randomly) stumbled upon these fabulous wingback gliders from Shetter Palevsky Interiors. What can I say? I love a tufted back. And curves on this chair are sweetly feminine without being cloying. Not a huge fan of either of these fabric options (they both read a bit granny to me), but rest assured there are plenty of other lovely prints and solids to choose from. And, of course, you can always C.O.M. I love the tailored , clean lines of this piece. And the upholstery job is subtle, but still really special. The trim along the skirt is a wonderfully crisp finish and the contrasting stripes peaking from underneath has be weak in the knees. This would be the perfect piece to anchor a nautically-themed nursery (which is one option I'm mulling...think lots of crisp navy and white with pops of color from nautical flags). While the offspring ottoman is less expensive, it still clocks in at $370 (for a solid fabric!) and at $545 for the super cute Hable Construction print (bottom left). Again, these ottomans are simple and inexpensive DIY projects -- and, unlike the gliders, needn't require a professional upholstery job. 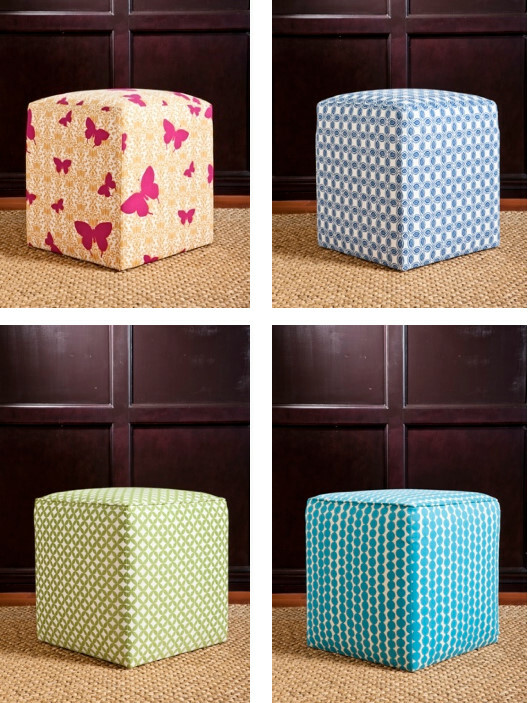 Indeed, I'd opt instead for a close flitting slipcover option over any tired ottoman cube. Indeed, here's a $60 option from Walmart, though you could certainly find one used even cheaper on Craigslist or Ebay. 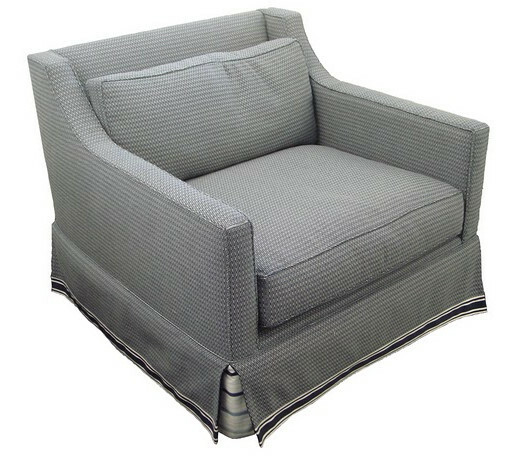 Sure, with a slipcover you won't have the nifty self welt but the savings/ease of use is probably well worth forgoing that small detail. Extra bonus: a slipcover would be washable! Very key for a nursery. To die for, no? Of course, the question that remains unanswered though is am I decorating for a baby girl or a baby boy? Alas, you (and I) will have to wait a few more weeks to find out! Love the two SUPER EXPENSIVE wingback gliders! I can't wait to see what you come up with! And the color scheme for the room. Well, like you said, we will have to wait! Congrats! First time commenter. I say spring for the glider. It is the hardest working piece of nursery furniture. I inherited one seven years ago It is ugly and creaks loudly. I still wish I would have bought a nice one. You really do use it until your child is about 4-5 for reading books, snuggling, soothing them while they are ill, etc. I would suggest a higher back one. You may be dosing off in it, so you need to be able to rest your head. Absolutely love these Averill! We ended up with a glider and an ottoman from Buy Buy Baby. We had it custom fitted in that bright orange corduroy fabric - I think it's on my Ms Foo bedroom piece. It's one of my favorite colors and will make it's way down to our family room whenever we're no longer in need of a chair to read to her in...which is still years away. Can't wait to hear if you're having a boy or girl! So exciting!! Those are some seriously beautiful gliders!! But, definitely a splurge! I'm secretly hoping you have a baby girl because I'm loving that fuschia & lime butterfly glider. :) Can't wait to see how your "inspired" glider turns out! Isla has learned she can test out her frog legs against the armrest of my glider. It makes for interesting nursing sessions when she wants to "exercise." Happy to hear you're feeling better, and can't wait to see what you come up with! Those are great. Most gliders are heinously ugly. The glider is a good investment in my book too. The Windward Wingback Glider is gorgeous! Great finds! The blue one totally reminds me of you. A tall backed glider is better as it'll keep your head from rolling backwards when you nod off with baby in arms. Momma will be frequently tired! Oh, these are all so lovely, but I think the Kingston Glider (from $2500) is especially so -- quite roomy and cozy, and ideal. Funny how once you are past a stage in life, better products become available. These gliders are so cute that having another baby is almost tempting. These are awesome! If you want something a bit more budget friendly take a look at the Best Chair Company's storytime series. I swear this is the most comfortable glider I've ever tested. They sell them at lots of baby stores....I am ordering another one for baby #2 just trying to find a fabric that isn't going to double the price of the gilder b/c I fell in love with a Schumacher Houndstooth. I am in the same camp with not dropping a fortune on the nursery. Hi, Averill! My goodness, a new house and a new baby, all in short order! What an exciting time for you. 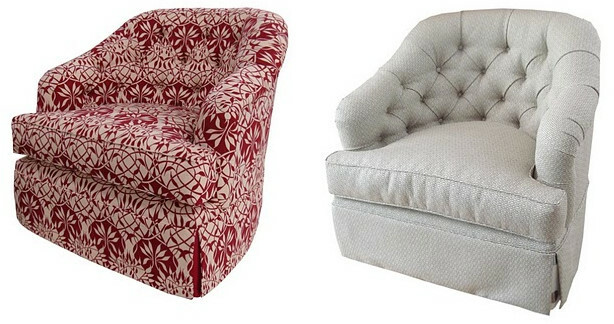 The wingback glider you posted is a very pricey chair--and I want to suggest that you also look at the chair frames at the Calico Corners - Calico Home stores. Many of them can be made as a glider. You'll have many more choices that way. 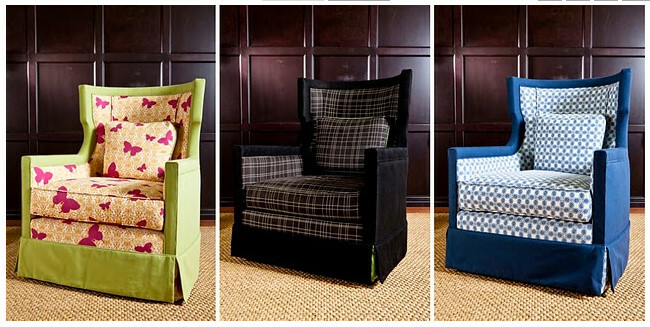 And of course, you can have the chair upholstered in any of Calico's 5,000 fabrics. Also, there's no reason you can't slipcover a cube and have the slipcover made with a self-welt or contrast welt on top. It could also be made with Velcro on the base to affix "flaps" of fabric that wrap under for a snug, tight fit. If only I had that much $ lying around! We got a glider from Wal-mart that we figured we could make a fun slipcover for. Now, I just need to figure out how to sew. Hi, Averill, and many congratulations to you and Dave! The glider was my big baby purchase, and I certainly didn't regret it. It comes in handy for resting weary bones later in pregnancy, so it might be something to get before the baby arrives. I, too, would encourage a high back, both so you can rest your head and so that your husband will be able to give it a shot. Most gliders seem designed for newborns and petite women, but there are others out there! 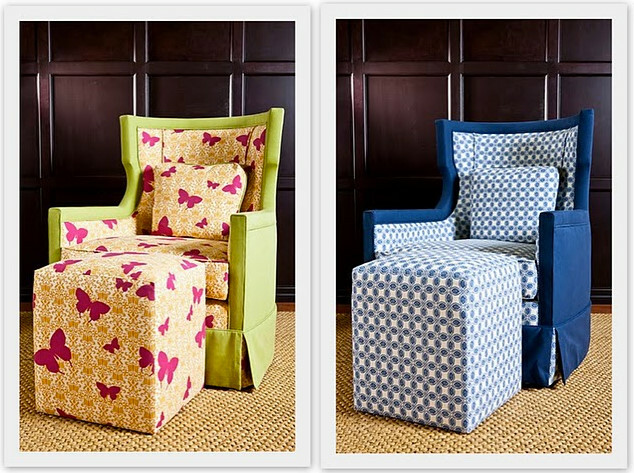 Love the combination of solids and prints on the Windward Wingback Gliders. Glad you're feeling the second-trimester second wind; I am only slowly getting there, but maybe that's because my toddler is using up anything extra I might have! Nice !i like it , so interesting...Thank you for sharing it. Wow, I love the unique design of those gliders. I want one in my family room! I actually went with on of the Dutailier gliders sold at http://www.simplybabyfurniture.com/shop-by-brand-dutailier.html and I love it. It's not as fancy looking as those, but both glider and ottoman rock together so it's one smooth motion and I enjoyed it when my baby was little and still love it in the den! It's a chair I plan to keep around forever for sure. If someone is looking for a practical glider that will fit in with just about any decor then I'd highly recommend dutailier gliders for sure.